Don Buford could definitely take off running, according to an assessment by his new manager in 1989. His problem, though, according to the assessment was the trip back to the dugout generally being a walk, not a sprint. "The kid can fly . . . he steals a lot of bases," AA Hagerstown manager Jimmie Schaffer told The Allentown Morning Call of Buford, before being described as pausing and adding, "but he strikes out a lot." Schaffer spoke before Buford's third professional season. Buford's career ultimately wouldn't last much longer, he got just one more year. Buford, though, would take off running in another direction - to medical school, ultimately helping others return to taking off running themselves, and return to other athletic pursuits as an arthroscopic surgeon. Buford's career began in 1987, signed by the Orioles as an undrafted free agent out of USC. USC was the same school his father, former major leaguer Don Buford Sr. went to. It was also the same school Buford's brother Damon Buford went to. 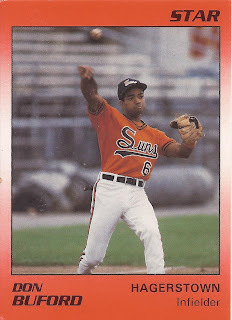 Damon Buford, also signed by the Orioles out of college, went on to a nine-season major league career. For Don Buford Jr., he played his first year at short-season Newark. He also hit well. In 71 games, Buford hit .298 and stole 35 bases. He also struck out 43 times. He moved to single-A Hagerstown for 1988, but his average dropped to .232. His stolen base total, though, went up to 77. His strike out total, too, to 87. Buford stayed at Hagerstown for 1989, but moved up to AA with the club. There, his average dropped even further, to .192. In 100 games, he stole just 30 bases and struck out 54 times. His final year came in 1990, with 50 games back at Hagerstown. Then his career was over. Buford just wasn't enjoying the game anymore, his father told The Baltimore Sun in 1991. Buford, though, had another calling. "We discussed it," Don Buford Sr. told The Sun. "We concluded that if he wasn't happy because he wasn't getting hits and wasn't playing much, it would be best to go back to med school. He wants to go into sports medicine." And Buford did, graduating from the UCLA School of Medicine, according to his bio on The Sports Medicine Clinic of North Texas site. Buford now helps athletes get back on the field, specializing in repairing shoulders and knees through arthroscopic surgery.